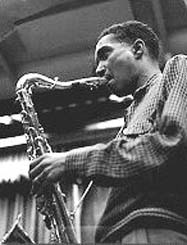 Wardell Gray was an American jazz tenor saxophonist who straddled the swing and bebop periods. Born in Oklahoma City, he moved with his family to Detroit in 1929. Gray began attending Northeastern High School and then transferred to Cass Technical High School, leaving in 1936 before graduating. Benny Cater called Gray in May 1955 to be part of the band at the opening the Moulin Rouge Hotel. He attended rehearsals but, when the club opened on 25 May, Wardell was absent. The next day he was found on a stretch of desert on the outskirts of Las Vegas dead with a broken neck. Although ruled an accidental death, foul play was suspected by some, especially given Gray's possible association with reputed mob boss Meyer Lansky.